Mount Druitt Hospital general services assistant Rachel Tucker prefers the popcorn as Kiosk volunteer Barbara Margerison watches on. 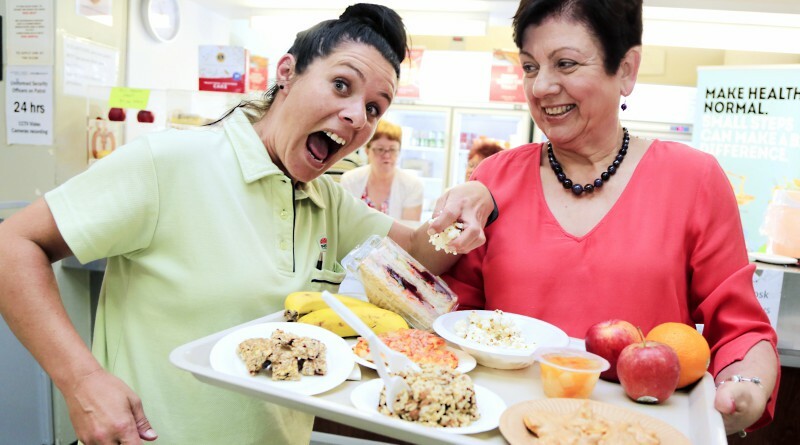 Mount Druitt Hospital’s kiosk is switching it’s selection of menu items to healthier, affordable and tastier options as part of the improvements across NSW Health facilities food outlets. The delicious, tasty options being considered for the kiosk include popcorn, tuna and cracker snack packs, tuna and rice lunch kits, muesli bars and mini pizzas. Western Sydney Local Health District Heathy Eating Active Living program co-ordinator Rachael Graham had the fun task of sourcing people to participate in the taste testing of these delicious items. Rachel didn’t have to search too far – on hand was cleaner Rachel Tucker who particularly liked the popcorn. Staff and visitors were encouraged to taste each item and provide their feedback. The overall winner was the mini pizzas which had a health rating of four stars. Mount Druitt kiosk volunteers Emily Jancek, June Burnard and Barbara Margerison support the healthier options. The health star rating is a nutritional rating which identifies products with high nutrient quality. The kiosk is the only food outlet within the district which is entirely run by the hospital volunteers, with all profits returning to the hospital. Healthy food and drink hospital ambassadors Jenny Suthar and Christine Mason support the healthier range for taste and affordability. Mount Druitt Hospital kiosk volunteer Barbara Margerison who has worked at the kiosk for two years supports the healthy change. Fellow kiosk volunteer June Burnard who is responsible for ordering the stock was keen to take part in the taste testing. “It’s important for us as a hospital to have healthy options for our patients, staff and visitors” Mrs Burnard said. “We are in a health facility and need to set a good example. Check out the new affordable tasty menu items at the kiosk next time you’re at Mount Druitt Hospital.